In addition to its other international activities, the Arthur A. Dugoni School of Dentistry continues to expand relationships with partners in China through collaboration, education and cultural exchanges. Dean Nader Nadershahi ’94 recently announced the appointment of Eve Cuny as assistant dean for global relations and Dr. Colin Wong ’65 as vice dean for China-U.S. relations. 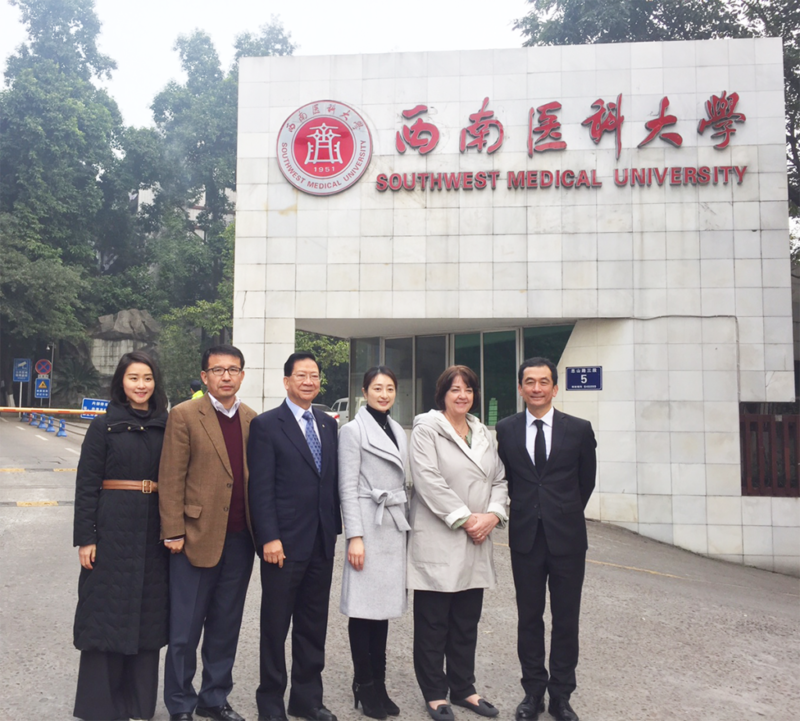 In January, Cuny, Wong and Dr. Elliot Xia ’00 IDS traveled to Chengdu in the Sichuan Province of China to meet with faculty members of the West China College of Stomatology and members of the California Center, an organization that promotes U.S.-China business relations. They discussed possible collaborations including student exchanges and academic opportunities related to the opening of a new school to train dental technicians and dental hygienists in nearby Ziyang. The group visited the site of the future technical college which is contained within a larger dental complex that will include manufacturing of dental equipment, distribution, testing and many other dental-related endeavors. In June, Cuny visited Chengdu again, where she continued discussions with West China College of Stomatology and the Ziyang city authorities regarding collaboration on the potential dental hygiene program. While she was there, California Governor Jerry Brown, in Sichuan to discuss California’s continued collaboration with the Sichuan Province, attended a breakfast hosted by the California Center. The organization is deeply involved in the California-Sichuan relationship to promote education, health care, clean energy, environmental stewardship and technology. On July 10 at the Dugoni School of Dentistry’s San Francisco campus, the Governor of Sichuan and former member of the Chinese Ministry of Health, Dr. Li Yin, attended the signing of a Memorandum of Understanding (MOU) between the Arthur A. Dugoni School of Dentistry and the West China College of Stomatology. Dean Nader A. Nadershahi ’94 also signed an MOU with the Tianfu Technical College, where the potential dental hygiene program will be housed, if realized. The dental school hosted a large group of dental industry leaders, Sichuan Province government officials and West China College of Stomatology leadership for the one-day meeting in San Francisco. On July 10 at the Dugoni School of Dentistry’s San Francisco campus, the Governor of Sichuan and former member of the Chinese Ministry of Health, Dr. Li Yin, attended the signing of a Memorandum of Understanding (MOU) between the Arthur A. Dugoni School of Dentistry and the West China College of Stomatology. Students and faculty also recently participated in international exchanges with Chinese counterparts. Over the summer break, Class of 2018 students Derek Appelblatt, Stefka Bozhinov, Jonny Volland and Jacob Woodward attended an international dental summer camp at the West China College of Stomatology in Chengdu held during the first two weeks of July. They joined other dental students from around the world in a program that fosters understanding and collegiality among students from a wide variety of cultural backgrounds. In addition, the Dugoni School of Dentistry completed an agreement to provide faculty presenters at a special one-week program of lectures to Chinese faculty, students and residents as part of Sun Yat-Sen University School of Stomatology’s efforts to foster bilingual education for its faculty, residents and students. The highly successful program featured faculty members Drs. Gene LaBarre, Anders Nattestad, Ray Scott and Adrian Vogt ’92, ’94 Ortho. The program took place in June in Guangzhou, China. Drs. 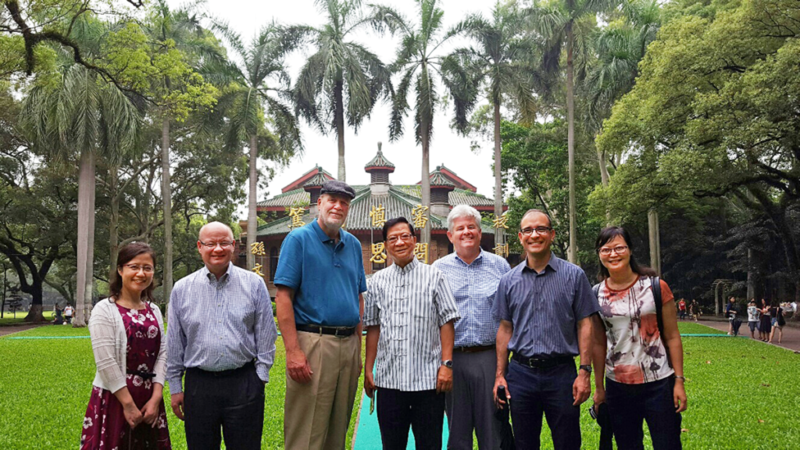 Anders Nattestad, Gene LaBarre, Colin Wong ’65, Ray Scott ’80 and Adrian Vogt ’92, ’94 Ortho with hosts in Guangzhou, China. Dr. Elliot Xia ’00 IDS, Dr. Colin Wong ’65 and Eve Cuny tour Southwest Medical University with the school’s dean and representatives from the California Center. 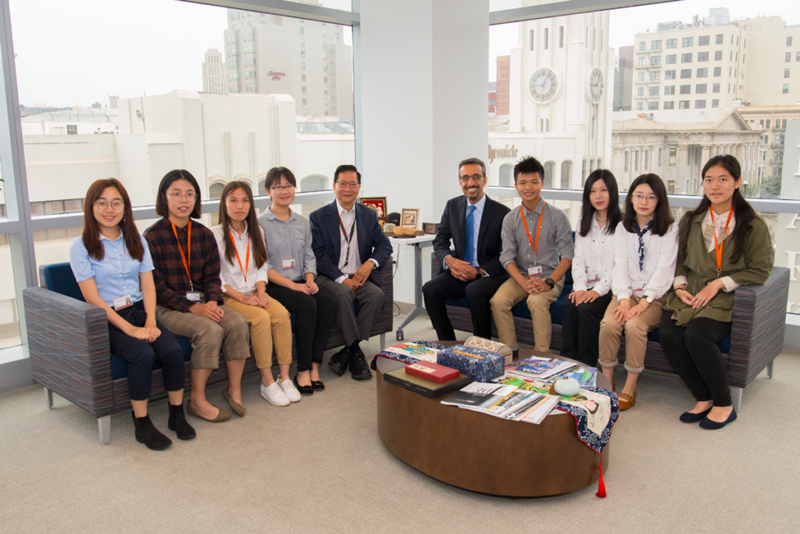 Students from Peking University School of Stomatology in Beijing visit with Dr. Colin Wong ’65 and Dean Nadershahi ’94 in August as part of an exchange program with their university.